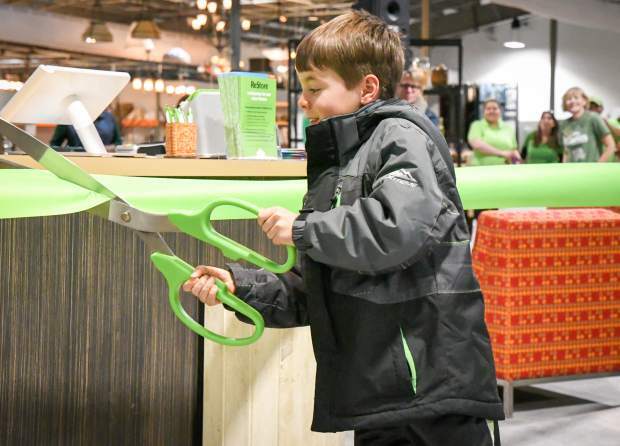 Six-year-old Harper French is the honorary ribbon cutter at the new Habitat for Humanity ReStore grand opening ceremony on Thursday afternoon. Scenes from the new Habitat for Humanity ReStore ribbon cutting and grand opening celebration. Habitat for Humanity Roaring Fork Valley’s new ReStore south of Glenwood Springs. Habitat for Humanity President Scott Gilbert address the crowd at the new ReStore ribbon cutting and grand opening on Thursday afternoon. 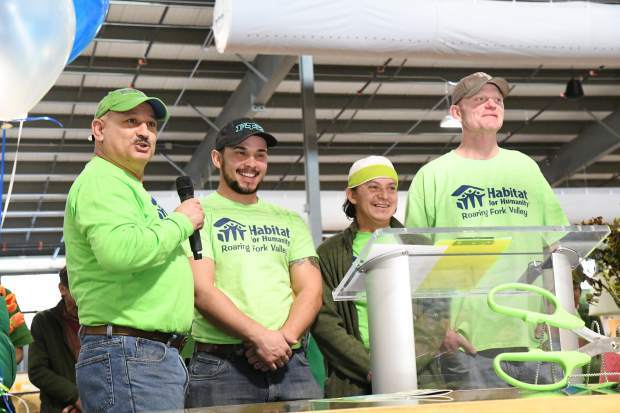 Hector Vazquez speaks highly of his ReStore team at the new Habitat for Humanity ReStore ribbon cutting and opening celebration. The ribbon is cut and the store is open for business at Habitat for Humanity Roaring Fork Valley’s new ReStore south of Glenwood Springs. A few dozen people crowded into an opening ceremony Thursday afternoon to mark the major progress of this new location — what Habitat staffers are calling ReStore 2.0. 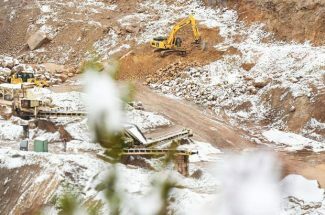 The ReStore, though it may not be obvious to those passing by, equals more homes and more jobs in the valley, said Scott Gilbert, director of Habitat for Humanity Roaring Fork Valley. 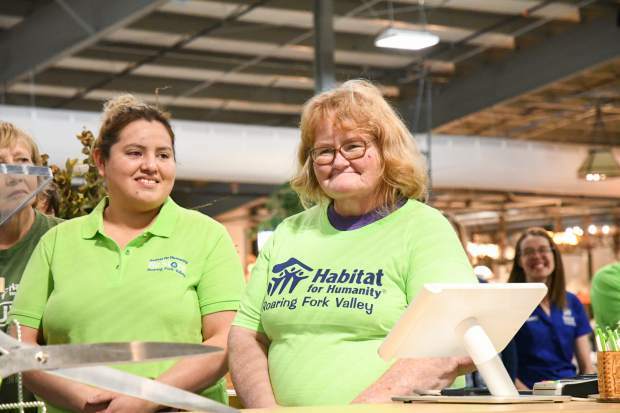 Though it is a great place to get some discounted household items, the ReStore is also critical engine that drives Habitat’s projects in the valley. 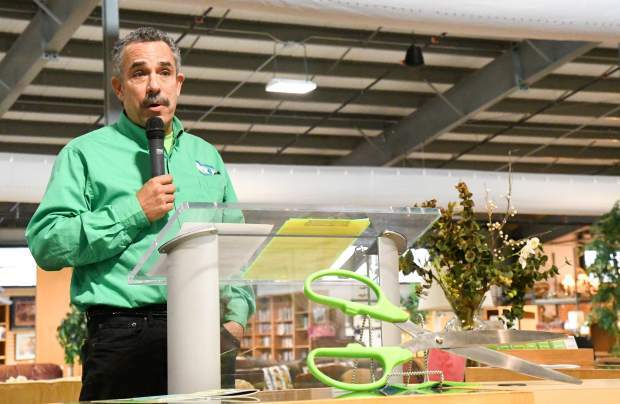 “We’ve always thought of the ReStore as a place to sell recycled stuff, but beyond that, if we can get items at good prices, and good prices to customers, we can net more money for building houses,” said Gilbert. Besides its sheer size, the build’s striking feature is its sustainable design, which is not typically true of steel panel buildings. Most of Habitat’s homes now are built to a very high green building standards, which brings costs down and makes them cheaper to maintain over time for the homeowner, said Gilbert. And with this project, the organization brought its home-building philosophy to its own forever home. The 40,500-square-foot building, nearly an acre large, was painstakingly designed for energy efficiency, with thick, super-insulated steel panels, a 56 kilowatt solar rooftop array, massive ceiling fans for optimal air movement and all LED lighting. Habitat also got a grant to wrap the steel panel building in an exterior rigid foam for a low infiltration rate. Its solar system is expected to offset about two-thirds of the ReStore’s electrical use. Altogether, these features are expected to save about $24,000 each year in the building’s utility costs. 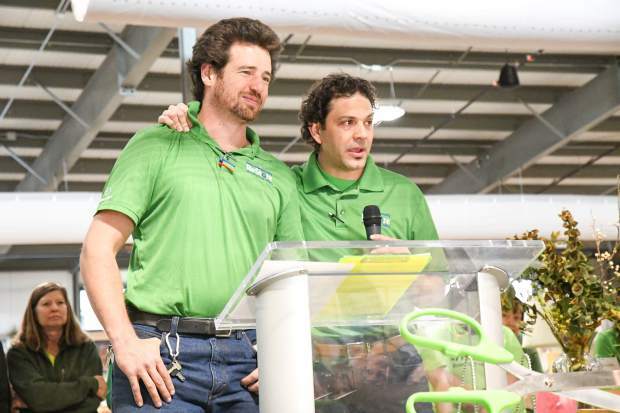 Habitat initially hooked up with the Community Office for Resource Efficiency for technical advice and support, but the sustainability organization became a major partner in the project, providing more than $200,000 in grants for the design work and for the rooftop solar panels. “It’s the right thing to do. And the silver lining is that it’s going to save money, and that’s what this is all about,” said Gilbert. 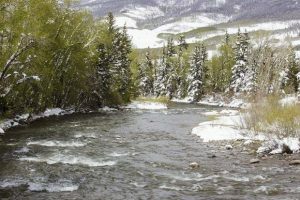 The need for the new ReStore is three-fold: the Roaring Fork Valley has a great need for affordable household items, its a permanent home for the nonprofit organization and it offers the Habitat staffers permanent, year-round jobs. 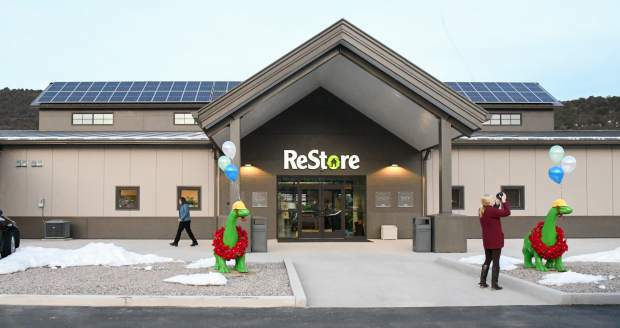 “First and foremost, [the ReStore is] a way to survive in this valley, where there is a lot of money but also a lot of people and organizations looking for support as well,” said Gilbert. At other locations Habitat was in a position where it had to keep chasing cheap rent. 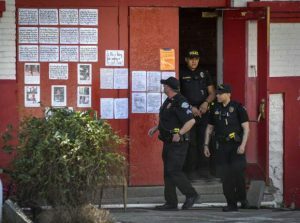 And even when they found it, they would only be able to stay in a location until the owner could sell it or get a higher paying tenant. “For us, that’s not a good stable, relaxing way to live,” said Gilbert. The ReStore was always under threat, and Gilbert was always waiting on that phone call, saying that they had 30 days to get out — which actually happened twice. 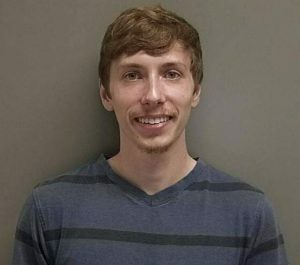 “Just like our nonprofit is all about home ownership, why wouldn’t owning our own building make the same logical sense?” he asked. After about three years in the works, and construction breaking ground in March, “it’s been a good smooth ride, but a long one,” said Gilbert. Habitat obtained a $6.9 million construction loan through Alpine Bank for the project, then a U.S. Department of Agriculture loan to buy out that construction loan. That USDA loan is one awarded to organizations that are seen as economic engines, so it’s basically a subsidized loan that would be much tougher to do in the private sector, said Gilbert. The new store will also feature a new pricing policy aimed at moving products faster by connecting those energy savings to lower prices for customers and therefore diverting more waste from the landfill. And not all of the ReStore’s products are used. Customers will see some new products stocked, such as new household appliances that are deeply discounted due to scratches and dents, new mattresses and cabinets built by a Colorado Department of Corrections wood shop.